His Nayakan is among Time’s ‘100 Best Movies Ever’; and Roja launched A.R. Rahman. This book, unique for Indian cinema, illuminates the genius of the man behind these and eighteen other masterly films. For the first time ever, Mani Ratnam opens up here, to Baradwaj Rangan, about his art, as well as his life before films. In these freewheeling conversations, candid, witty, pensive, and sometimes combative, many aspects of his films are explored. Mani elaborates in a personal vein on his choice of themes, from the knottiness in urban relationships (Agni Natchatiram) to the rents in the national fabric (Bombay); his directing of children (Anjali); his artful use of songs; his innovative use of lighting, as also his making films in Hindi and other languages. There are fond recollections of collaborations with stalwarts like Balu Mahendra, P.C. Sreeram, Thotta Tharani, and Gulzar, among many others. And delectable behind-the-scenes stories—from the contrasting working styles of the legendary composer Ilayaraja and Rahman to the unexpected dimensions Kamal Haasan brought to the filming of Nayakan to what Raavan was like when originally conceived. 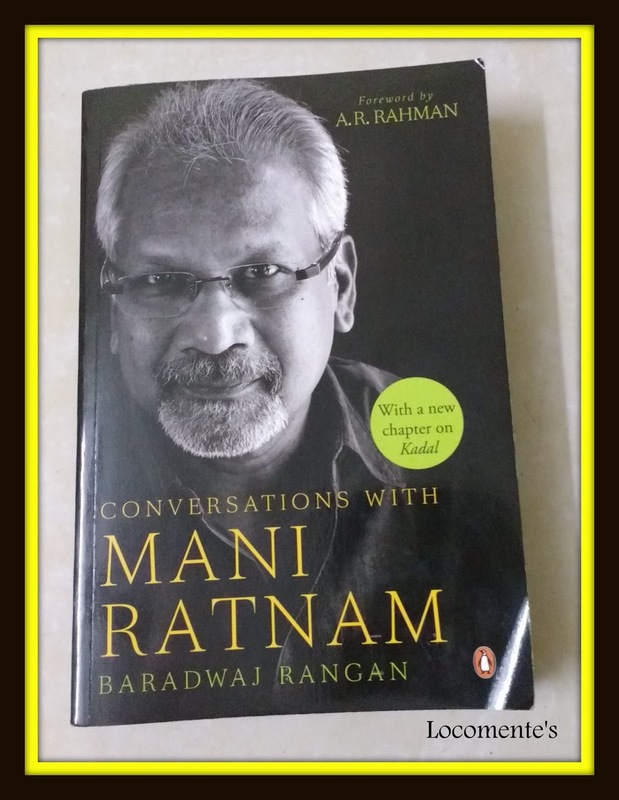 In short, like Mani Ratnam’s films, Conversations with Mani Ratnam surprises, entertains and stimulates. Baradwaj Rangan is a well-known film critic. Apart from heading the position of Deputy Editor of the popular newspaper The Hindu, he also teaches a course on cinema at the Asian College of Journalism in Chennai. I belong to a generation whose patriotism was evoked by Roja and togetherness by Bombay… Passion for love by Alaipayuthe and desire to bring a change by Aaydha Ezhuthu/Yuva. Guru showed how to dream big while Kannathil Muthamittal showcased that the grass need not always be greener on the other side. If you have known me or read my blog for that matter, you might know that I am obsessed about Alaipayuthe, the movie. For those who don’t know, I would have watched it more than a hundred times! (Click here to know more!). Hence, getting hold of Conversations with Mani Ratnam and understanding the perspectives of the director sounded relevant for the movie buff in me. When I saw that it is compiled by Baradwaj Rangan, renowned movie critic, I was excited. After all, I still remember those Sunday afternoons spent reading his reviews in The Indian Express. The book begins with a foreword from none other than AR Rahman. What I liked about the book is that the chapters are neatly arranged based on the movies directed by Mani Ratnam in chronological order. It is amazing to know about his early days of struggle as a director, sources of inspiration, how he decided about the cast and crew for his films and how he raised from the status of South Indian director to a Pan-Indian image (especially after Roja). The narrative is in simple question and answer format. As the director speaks, we understand his films more; his perspectives more. We get to know that Padmasree Kamal Hassan improvises scenes and takes them to different level and Superstar Rajinikanth is a director’s actor. Ilayaraja and AR Rahman have a very distinct style of working. We realize that Mani Ratnam is at his best when he deals with complex relationships. It is startling to see that such traits have been there since his first film Pallavi Anupallavi (I have not watched it though. I have also not watched Geetanjali). Having said that all other movies indeed deal with one or the other aspect of relationships (I have watched all others!). The versatility of the director reiterates why he is what he is! 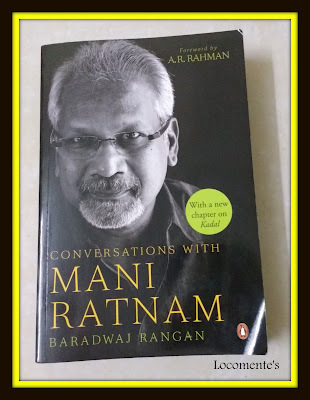 The flow of the conversations between Baradwaj Rangan and Mani Ratnam is lucid. The book restricts itself to the cinematic life of the director without dwelling into his personal life and turning it into a biography. The director’s humility to accept his mistakes and agree that he could have done certain things differently, makes him a role-model. If you enjoy movies and if you are a fan of Mani Ratnam movies, don’t miss this book! I am sure that next time you watch his old movies, you would understand it better; the intricacies and complexities in it better. You would appreciate it more. I watched Ravanan again recently and I saw it through a new angle this time. Hmm , that is not a bad style of critiquing. Enjoyed reading. I thought Pagal Nilavu was his first film? I have a lot of respect for him and I have been spellbound watching most of his movies at a young age. Need to watch some of his recent movies, though! I want to read this book soon. I'd prefer to listen to it, so will see if an audio book is available. Ooh, that's impressive. It's always good to get inside great minds. He is no doubt a genius. Good go.